Thanks to countless cartoons, we all know the iconic image of St. Peter perched at a desk, with his big ledger book, surrounded by fluffy clouds, just outside the Pearly Gates: You get to enter heaven if you’ve got enough good deeds to your credit. While most Christians—I suspect, I hope—know this scene is comic book stuff, they do go along with the theology behind it. In fact, they know this in their guts. That is, God lets you in if you’ve been a good person. If you’ve been bad or nasty, then your odds go down. Isn’t that just fair play, common sense? After all, heaven is called your Eternal Reward. But the New Testament requirements for making the grade are not really that simple, thanks, in large part, to the theology of Paul. He didn’t see eye-to-eye with Peter anyway, so giving Peter a desk at the Pearly Gates wouldn’t have been his idea. That’s a story for another time, however. Paul recoiled at the idea that anyone could deserve to be granted eternal life. There was no way to merit it. His Letter to the Romans stands in the way of this intuitive approach,i.e., adding up your good deeds to get into heaven. So now let’s open our Bibles to Romans, chapter 3. Atheists who want to make the case that the good book is not all that good should know how bad the Book of Romans is. I’m offering a guided tour of this 16-chapter book of the New Testament (one chapter every other week) for that reason, and because it had such major impact on Western thought. Christian theologians have given it far more credit and study than it deserves. I once encountered a young Christian who told me that she didn’t know about the Letter to the Romans. Yes, biblical illiteracy is rampant among the faithful, but lucky her. “All have turned aside, together they have become worthless; there is no one who shows kindness, there is not even one ” and “Their throats are opened graves; they use their tongues to deceive. The venom of vipers is under their lips.” In verse 20 he states that nobody can get right with God by doing what the law requires. To his credit, Paul felt that belief in Christ allowed access to God’s good grace to everyone. Being Jewish and following the law—well, this didn’t matter much any more, and this is the point he makes again in the closing verses (27-31) of Romans 3. But it’s small consolation in light of the bad theology that he embedded at the heart of Christianity. There is nothing sublime, noble or redeeming about his blood sacrifice theology; it is unworthy of one of the ‘great’ world religions. Filius Flitwick was the Charms Master at Hogwarts and could have added Paul’s spell about having faith in blood to his syllabus; Severus Snape was the Potions Master, and the drinkable blood championed by John would fit well into his syllabus. What a sorry state of affairs that Christian theology sank to these lows. Harry Potter has more entertainment value—and we know better than to take it seriously. 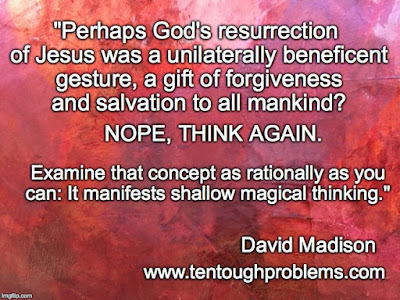 David Madison was a pastor in the Methodist Church for nine years, and he has a PhD in Biblical Studies from Boston University. 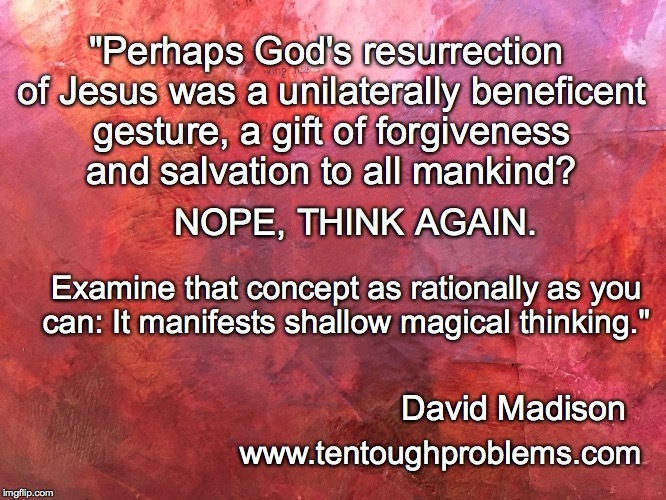 His book, Ten Tough Problems in Christian Thought and Belief: a Minister-Turned-Atheist Shows Why You Should Ditch the Faith, was published last year by Tellectual Press.